Mangrove trapdoor spider Idioctis sp., copyright K. Stenchly. Contains: Dipluridae, Hexathelidae, Nemesiidae, Rastelloidina, Theraphosidae. 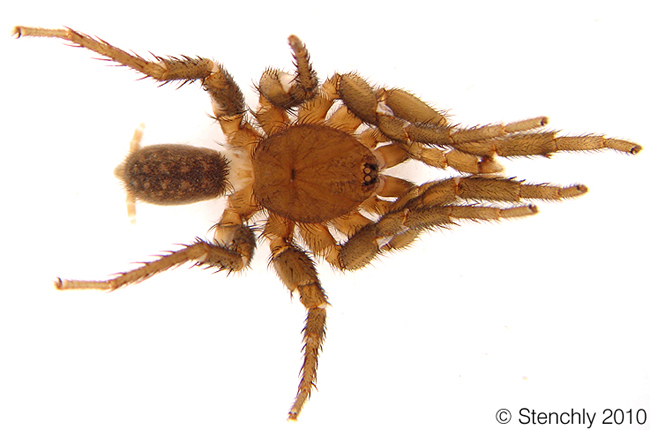 The Avicularoidea is a clade of mygalomorph spiders in which the male palps have the bulb perpendicular to the cymbium or directed back towards the base. This clade is further divided between the Dipluroidea, with numerous maxillary cuspules on the labium and a prolateral spine on the first tibia of the male, and the Crassitarsae, with a serrula present on the maxilla and small, closely placed posterior lateral spinnerets (Jocqué & Dippenaar-Schoeman 2007). Synapomorphies (from Jocqué & Dippenaar-Schoeman 2007): Abdomen with dorsal scutum; posterior lateral spinnerets close, three articles of posterior lateral spinnerets with spigots; male palp without conductor, axis of palpal bulb orthogonal to cymbial axis or directed towards base, cymbial cavity apically open, incised and membranous. [BB14] Bloom, T., G. Binford, L. A. Esposito, G. A. Garcia, I. Peterson, A. Nishida, K. Loubet-Senear & I. Agnarsson. 2014. Discovery of two new species of eyeless spiders within a single Hispaniola cave. Journal of Arachnology 42 (2): 148–154. [FM11] Freire-Jr, G. de B., & P. C. Motta. 2011. Effects of experimental fire regimes on the abundance and diversity of cursorial arachnids of Brazilian savannah (cerrado biome). Journal of Arachnology 39 (2): 263–272. [J98] Jäger, P. 1998. Das Typenmaterial der Spinnentiere (Arachnida: Acari, Amblypygi, Araneae, Opiliones, Pseudoscorpiones, Scorpiones, Uropygi) aus dem Museum Wiesbaden. Jahrbuecher des Nassauischen Vereins fuer Naturkunde 119: 81–91. [K92] Karsch, F. 1892. Arachniden von Ceylon und von Minikoy gesammelt von den Herren Doctoren P. und F. Sarasin. Berliner Entomologische Zeitschrift 36 (2): 267–310. [M54] Main, B. Y. 1954. Spiders and Opiliones. In: Willis, J. H. (ed.) The Archipelago of the Recherche pp. 37–53. Australian Geographical Society: Melbourne. [R14] Rainbow, W. J. 1914. Studies in Australian Araneidae, no. 6, the Terretelariae. Records of the Australian Museum 10 (8): 187–270. [T13] Taylor, C. K. 2013. Annotated bibliography for Barrow Island terrestrial invertebrates. Records of the Western Australian Museum Supplement 83: 135–144. Last updated: 23 June 2017.